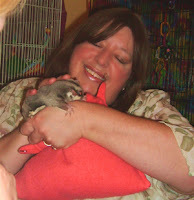 If you breed or rescue sugar gliders we encourage you to assess your sugar gliders using the Higdon Sugar Glider Behavior Scale developed in 2003 by Angie Hosksin-Higdon when she saw the need during her rescue work. Level 1- Sugar gliders is people friendly, may crab when startled, does not bite, but may lick, or nibble when grooming its human. Level 2-Sugar glider is frightened will bite when handled. Needs an owner who is willing to learn and be patient. Level 3- Sugar glider is terrified will bite and/or lunge when handled. Sugar glider needs an experienced and patient owner with lots of time to spend earning the gliders trust. Level 4- Sugar glider has health issues that will require ongoing vet care. Sugar glider may be a recovered self mutilator who may repeat behaviors. Needs an owner who is experienced, willing to learn, has lots of time to spend caring for the glider along with money for vet care.